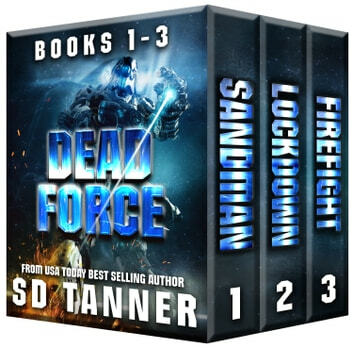 This omnibus edition of the Dead Force Trilogy contains the first three books: Sandman, Lockdown and Firefight. Tag is a man without a past and a bad future. Waking up in a chamber full of half a million sleepers is bound to confuse anyone, but learning you're on a spaceship hurtling through the universe will really ruin your day. Finding over a million sleepers on three arks, an infestation of space fleas, and no idea how he or the squad got there, Tag is having a bad day. Uncovering the truth proves more bizarre than he could have guessed, but never one to pass up a challenge, Tag decides revenge is the best course of action. In search of the truth, Tag and his squad head to Earth where they learn just how far they are from where they started. Realizing they’re not entirely blameless for what happened to the world, Tag desperately looks for a way to gain the upper hand against enemy aliens he can’t even find. War is about real estate and, with Jessica near death, Tag is running out of time to reclaim even a small part of his country. The Dead Force are willing, but Tag must find a way to steal what he needs from the aliens to turn them into an effective fighting force. Determined to slam a stake in the ground and declare it his, Tag raises his bet, but it just might be a step too far. 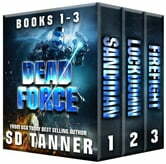 Dead Force series is the latest in the SD Tanner collection. It’s a wild ride through space, filled with cool tech, mad aliens, and a stubborn squad refusing to quit. Dead Force: Books 1-3 can be read as a standalone trilogy. Also available: The omnibus edition of the Dead Force Series containing the final four books: Valhalla, Warlord, Judas and Eagle.